In the United States there are roughly 8.4 million people with some form of visual impairment. In the entire world, that figure increases to 253 million, a population size greater than that of Brazil. Can technology help them? When people talk about the possibilities of augmented reality (AR) tech they unfortunately tend to gravitate way too quickly to retail apps and games. Helping people who are legally blind or have impaired vision could be significantly more life-changing, however. With this in mind, researchers at the U.K.’s University of Oxford are developing smart glasses that can pick up on specific weaknesses in a person’s eyesight and enhance just those details. The OxSight glasses use a combination of computer vision algorithms and cameras to exaggerate certain details in an image, such as increasing image contrast or highlighting specific features. The Android-powered glasses aren’t out yet, but the project creators claim the final versions will look just like regular sunglasses, so shouldn’t make users stand out from the crowd. We take it for granted that machine translation tools can translate, say, German into English. But what about translating into Braille, the tactile writing system developed for people with visual impairments? That’s something MIT’s “Team Tactile” have been working on with a device designed to carry out real-time translation of “regular” text into Braille. The gadget features a scanning mechanism which lets users take an image of a picture to be translated. Optical character recognition (OCR) tech is then used to extract the text, before the lines of translated text appear on a physical display, which features pins that move up and down to form the Braille characters. The team aims to have a final prototype ready for manufacturing in the next couple of years. Researchers at the California Institute of Technology have created an app for Microsoft’s mixed reality HoloLens device which can guide individuals through a complex building with a combination of 360-degree sound and real-time room/object mapping. This could be used to either guide individuals to specific objects or to help them follow a pre-set path by calling out the words “follow me” from the direction they need to head in. Braille is brilliant for those able to read it, but doing so can be pretty darn tough. But there’s good news: A simpler alternative hit Kickstarter earlier this year, promising a new font which can be learned in hours instead of months. ELIA Frames, as it’s called, can be installed on a computer like a regular font, and then put onto paper using a special printer that’s capable of tactile printing. Current shipping plans are for later this year. If you don’t want to wear an intrusive Hololens headset, you might want to try the wearable device developed by researchers at VTT Technical Research Center of Finland. Called Guidesense, it’s a box-shaped device that’s worn like a heart rate monitor. 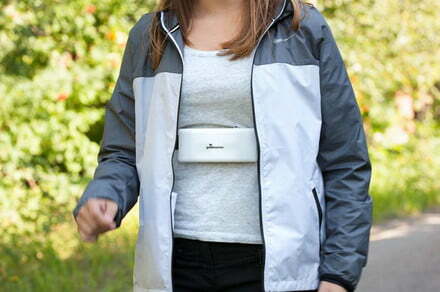 Thanks to millimeter wave radar sensors, the device is able to detect obstacles — even including thin overhanging branches — in the path of the wearer, and then relay this information in the form of haptic and audio feedback. In tests, 92 percent of subjects said Guidesense helped them better perceive their environment, while 80 percent felt more confident moving around on their own. All of the options on this list do a great job of presenting technology which could help a person work around their visual impairment. But what if it was possible to actually use technology to restore a person’s eyesight for real? That idea is, in fact, getting closer to reality. For instance, earlier this year, researchers at the U.K.’s Newcastle University mixed stem cells with algae molecules to create a bio-ink, with which they 3D-printed an artificial cornea. In another piece of research, the company VisionCare has developed an Implantable Miniature Telescope, which can replace the eyeball’s regular lens and restore parts of patients’ vision. While both of these technologies are still early in their life cycles, they hint that the next major wave of tech for people with visual impairments may be even more transformative than the current options.